Pregnant women with genital herpes should talk to their doctor as genital herpes can be passed on to the baby during childbirth. 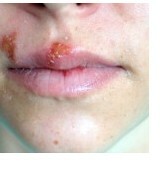 Often, the appearance of herpes simplex virus is typical and no testing is needed to confirm the diagnosis. If a health care provider is uncertain, herpes simplex can be diagnosed with laboratory tests, including DNA -- or PCR -- tests and virus cultures. There is no cure for herpes simplex. Once a person has the virus, it remains in the body. The virus lies inactive in the nerve cells until something triggers it to become active again. However, following the program described below will cause the virus to remain dormant. It is recommended to take the full program once followed by only taking VS-C tcm on a daily basis for proper maintenance and to keep the virus at bay! Virus-fighting immune system Stimulant. Chronic viral infections include flu, infectious hepatitis, Epstein Barr and herpes (including cold/canker sores). Dr. Xie feels it may benefit persons with chronic immune deficiency (including AIDS) and those who have had antibiotics prescribed to excess. I just read your article on herpes and I wanted to share with you my experience with taking VS-C. I have herpes and I used to get outbreaks all over my lips. It was bad and very embarrassing. When I broke out it surrounded both my top and bottom lips and the itching was terrible. II read on a message bored one day that VS-C was a cure. The person who wrote the comment stated that after taking the pills for 6 months they were cured. I read what information I could find on VS-C and decided to try it for 6 months. I have yet to have another out break since I've stopped taking it. It has only been a little over 3 months but 3 months clear is a great thing for me! I don't know if that person was actually right about it being a cure but I can say for sure that it has helped me. I just wanted to share that. I really enjoy your newsletters by the way! They are very informative. Virus-fighting, gland-regulating amino acid I-Lysine is not produced in the body and must be obtained from the diet. This is often difficult because it is destroyed by cooking. I-Lysine regulates ovaries, mammary and pineal glands. It works with vitamin C/bioflavonoids to build collagen for new connective tissue and bones. I-Lysine is necessary for all amino acid assimilation. It is used to fight fever blisters/cold sores and mouth ulcers (herpes simplex virus). The required dose ranges from 400 to 1,000 mg.